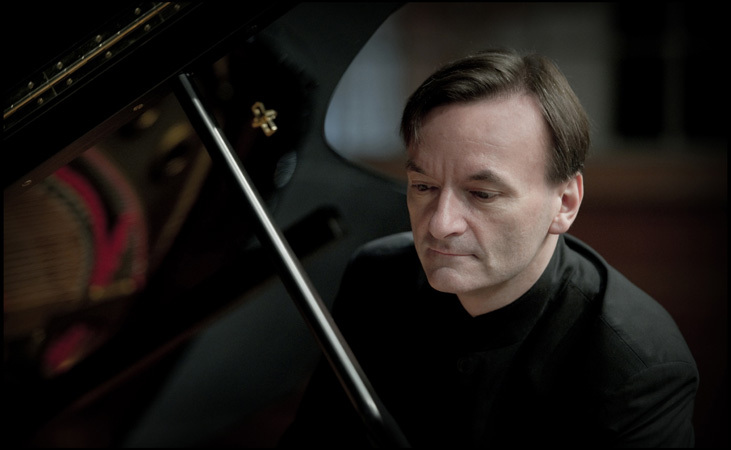 Stephen Hough has an impressive resume as a pianist, with some of the worlds’ finest Symphonies and Philharmonics. He is known for his prominent transcriptions and is a respected composer whose work makes interesting use of contemporary romantic metaphors and ideas that take him into the realm of dissonance. 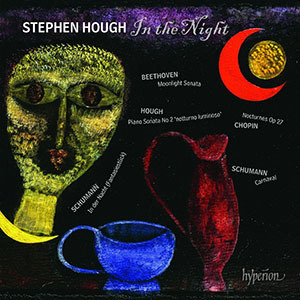 On this showcase, it is Mr. Hough’s extraordinary musicianship that arise from his great technical skill and the depth of expression, which enables him to traverse such varied fare as excerpts from Schumann’s Fantsiestrücke, through Beethoven’s Moonlight Sonata, two of Chopin’s Nocturnes, Schumann’s Carnaval and his own notturno luminoso. This is all on a disc he calls In the Night and it might as well be named for the shimmering and beguiling character of the piece that is beguiling and invitation to the echoing charms of the night. Throughout the music is played wonderfully where spontaneity and superlative technique coexist most vividly. 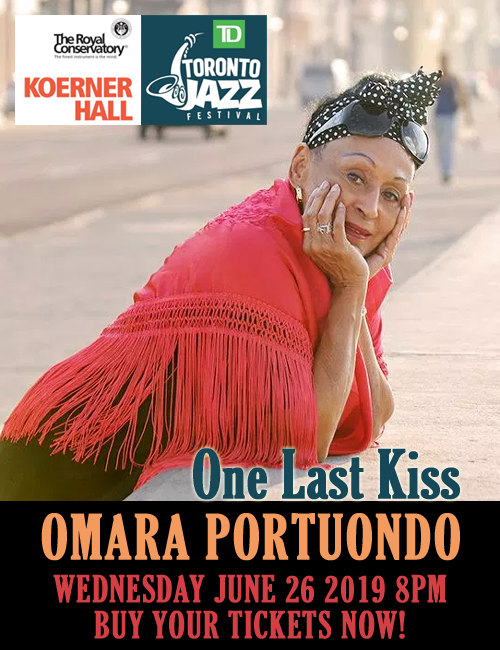 Here the miracle of poetry and heady bravura is melded in with clear structural architecture all of which comes together in a work of rather staggering proportions. The delicacy of Schumann’s Fantsiestrücke, is expressed in same inspiring fragility that Schumann experienced when he composed his piece, in response to his despair when Clara had once returned all of his letters to him. In Mr. Hough’s playing the depth of expression makes for a springing up of slender, gossamer-like phasing from hidden depths that vanishes as consciousness is reached in the chimerical scenes that evoke the higher realities of Romanticism, the worlds of night, twilight and dreams. This same vividness finds expression in the spontaneity , invention and superlative technique of the other Schumann composition on the programme–Carnaval. This series of tableaux, a masked ball of sorts was written by Schumann in 1834 to describe the events when one character after another takes the stage in this drama. It was also described by Schumann as “Little scenes on four notes”. John Field’s invention—the piano nocturne—derived from the bel canto arias of Bellini was to be transformed by Chopin, from charming, essentially languorous creations into something of greater emotional range, though a sense of wistfulness prevails. The two—and other—nocturnes are pieces that established Chopin’s reputation in the aristocratic salons of Paris and their absolute simplicity and directness have made them the most popular of all of his works. Mr. Hough certainly does justice to the qualities of these excerpts from the works and his playing is both sprightly and direct, a display of brilliant fingerwork done in an affectingly personal manner. Mr. Hough brings the same qualities of musicianship to bear on Beethoven’s Moonlight Sonata. It opens with Beethoven’s famous piano passage, a dreamy, melancholic movement that is now too well-known to be heard as the revolutionary idea that it was. By labeling this sonata (and its twin, No. 13 of Op.27) as “Quasi una fantasia,” Beethoven was explicitly differentiating his work from the weighted, formal structures of his predecessors, and by opening the Moonlight with a slow movement he was instantly establishing the sound world in which the certainties of Classical form no longer applied. Mr. Hough’s performance of the memorable sonata just do so; expressing the inward-looking freedom of construction of the piece and its alternating moments of unannounced restfulness and sudden near-dementia as it looks forward to the late sonatas of Beethoven.